One of my favorite salads, easy to make and if you are a tuna fan like me, the combination with tomatoes, boiled eggs and olives really makes it into a great breakfast. Heck I even had this late in the afternoon and I enjoyed it with the same passion, but then again I am probably more of a breakfast guy to be honest. Still, there a a couple of changes from the classic formula, no black olives and a couple of extra crazy spicy little hot peepers, just to bring up the flavor a little bit. Whisk together vinegar, lemon juice, garlic, mustard and olive oil. Add salt and pepper to to taste. 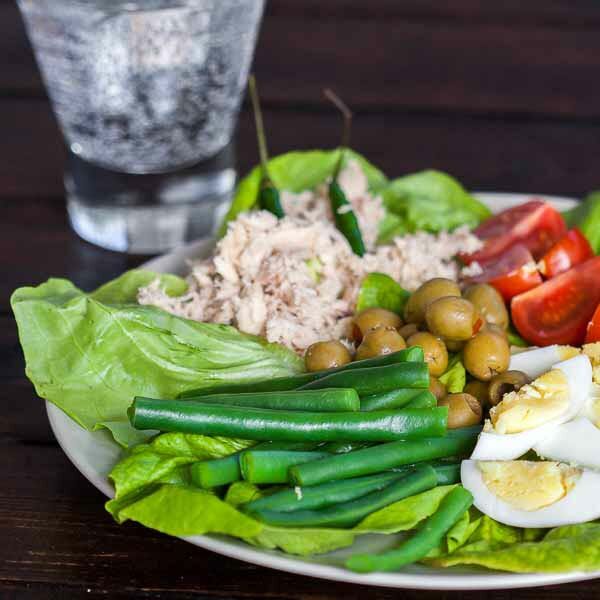 Arrange green beans, tomatoes, eggs, tuna and olives over lettuce. Drizzle with dressing and serve.